Delta Junction got its name from the river along which it is situated and from the junction of the Alaska Highway and the Richardson Highway. The town came into being as a construction camp for the building of the Alaska Highway in 1942 and the Fort Greely army post in the early 50s. The city was incorporated as a second class city under Alaska law in December 1960; it has a mayor/council government. 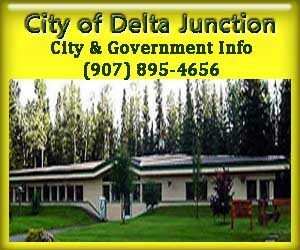 The City of Delta Junction does not assess municipal sales or property taxes. Financial support comes mainly from state and federal revenue-share monies. Land status within the City of Delta Junction is complex. Major landowners include the State of Alaska, the University of Alaska (a land grant college), private individuals, the federal government and the city itself. of the 9,023 acres within the city limits, 44 per cent is state-owned and 24 per cent belongs to the University. Delta Junction has a 27-acre park with ball fields and playground. The Delta Community Library is located just off the Richardson Highway at 2291 Deborah Street across from City Hall and next to the Community Center. The new building was constructed in 2004 with Impact Funds from National Missile Defense at Fort Greely. A Community Library has been a important part of Delta Junction since 1960. Most streets which come under city jurisdiction have been completed to 26-foot wide, paved surface. A modern sanitary landfill has been constructed and is in use. Facilities for small aircraft include a 2,400-foot crushed gravel runway and a 1,600-foot grass, cross-wind runway completed in 1990.